1. It is illegal to double park and to park in bike lanes on the north side of Los Gatos Almaden. 2. Respect the neighboring streets and safety of pedestrians and bikers by slowing down and driving responsibly. 3. Do not block neighbor driveways to park or to drop off/pick up students. 4. Be aware of the dangers of making u-turns on busy roads and neighborhood streets. 5. Ensuring the safety of our students and residents of the community is everybody's responsibility. You have two choices. 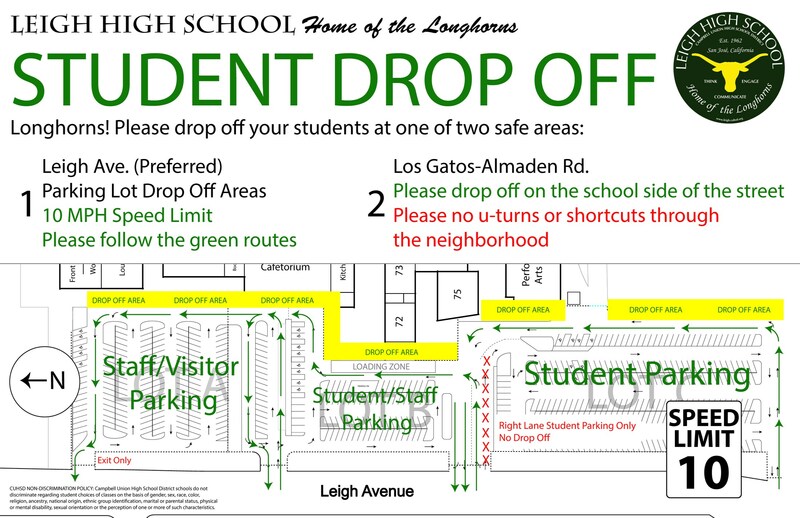 (Preferred) To drop your students off in the parking lot, please use the gate between lots "B" and "C" and drop off your students in the designated drop off areas marked on the map. Remember, your students are learning how to drive by watching you. On LG-Almaden Rd. please drop off your student on the school side of the street.This has been extended to the baseball field. Please avoid making illegal u-turns or using the neighborhood as a shortcut back to the freeway. In the mornings, LGPD and SJPD will be monitoring LG-Almaden Rd. 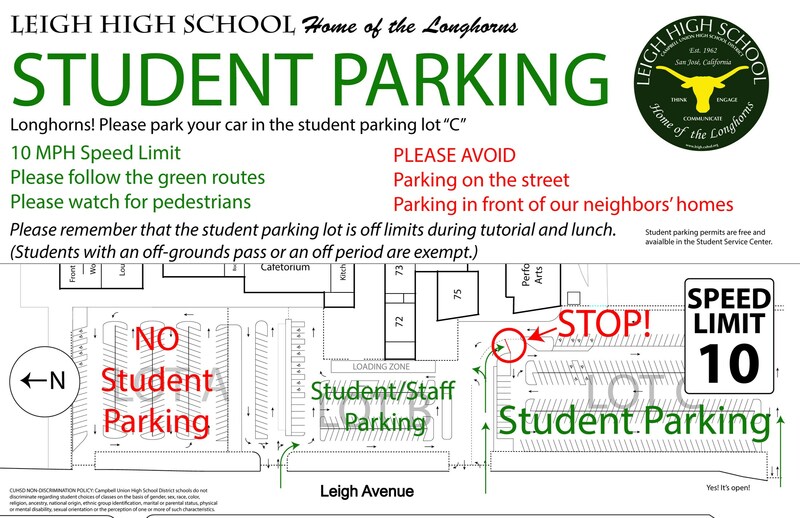 and Leigh Ave.
You may park in Lots B and C. Lot A is for Staff Only and parking permits will be enforced. Please obey the stop sign, watch for pedestrians, and never make a u-turn through the handicapped parking area. We are asking that you no longer park your cars on the street or in front of our neighbors homes. Please remember that the parking lots are off limits during the school day, including tutorial and lunch.